ALEXANDRIA, VA – For the past three years, Fashion’s Night Out events across the US have wowed spectators and given designers the opportunity to showcase new products in an upscale and fun environment. 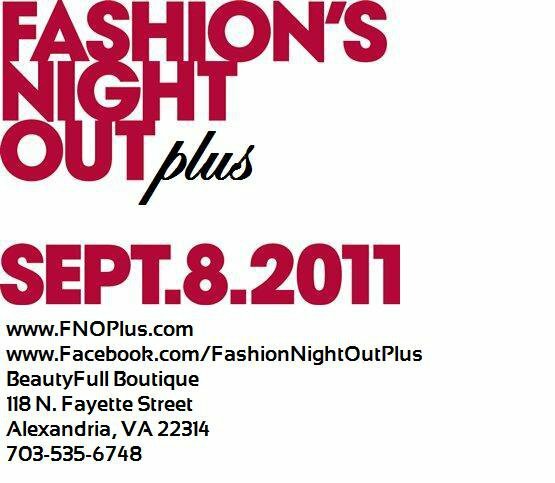 On September 8, 2011 from 6-11PM, the momentum of Fashion’s Night Out will take on a new twist in the DC Metro Area by catering exclusively to the Plus Size Community. To help celebrate the curvy festivities, Fashion’s Night Out Plus has invited Celebrity Stylist & Designer Rafael Cox of Project Runway Season 9, WPGC On-air personality Poet from the Sunday Brunch, Mrs. Jewell Green owner of the Posh Boutique, Comedian Queen Aisha and a host of other VIP/celebrity guests. Fashion’s Night Out Plus will be holding raffles every hour on the hour for its participants to use at their own discretion. The night has been sponsored by Galceau’VitaminWater(r). Other sponsorship opportunities for this wonderful event are still available! and able to walk in 3-5 inch heels. All nationalities and ethnicities are welcome. Bring 3-5 inch heels to walk in. Please bring foundation garments but do not wear them. Please wear natural style makeup. Must have a FIERCE walk! Any questions, please email us at FNOPlus@yahoo.com.